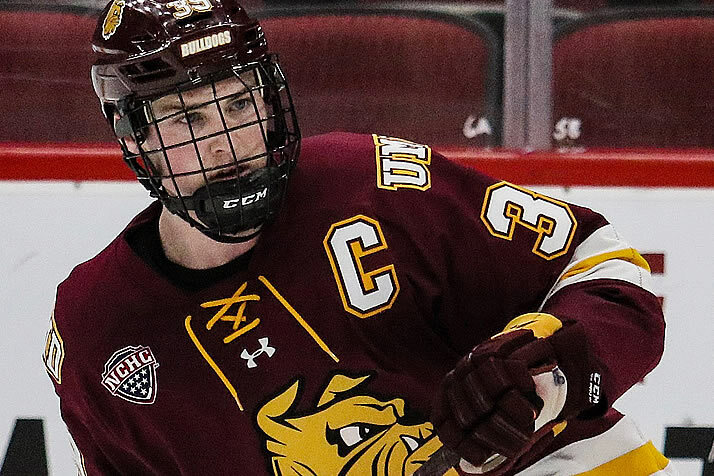 Mackay Among Stars from Alberta - College Hockey, Inc.
Minnesota Duluth captain part of a growing wave of top players from his home province. Parker Mackay scored three of UMD’s five goals in the NCAA Midwest Regional. There’s a distinct Alberta flavor to the 2019 NCAA Frozen Four, part of an exceptional season for college players from the province. Cale Makar (Calgary, Alta./Brooks-AJHL/COL) gets the headlines, but Minnesota Duluth’s Parker Mackay (Irma, Alta./Spruce Grove-AJHL) also leads his team in scoring entering Thursday’s semifinals. He takes notice of the success of his fellow Albertans. In addition to Makar and Mackay, Denver’s Ian Mitchell (Calahoo, Alta./Spruce Grove-AJHL) is another standout. They are part of a wave of Alberta-born talent that includes the nation’s co-leading scorer, Taro Hirose (Calgary, Alta./Salmon Arm-BCHL) of Michigan State. The province’s junior A league, the AJHL, has been churning out talent and 84 Albertans played Division I this year. For many, like Mackay, it helps to have role models whose footsteps you can follow. Former Minnesota Duluth defenseman Carson Soucy is Mackay’s cousin, and got to UMD two years before Mackay. The current Bulldog captain has evidence that the pipeline could continue. Unlike Makar, Mackay didn’t arrive on campus as a superstar. He has developed into a leader on the team, improving every statistical category – games played, goals, assists, points, plus/minus – in each of his four seasons. Now Mackay is enjoying his third straight Frozen Four, and is two wins away from a second consecutive national title. Meanwhile he’s blazing a trail for the next set of Albertans to follow him to the NCAA ranks.